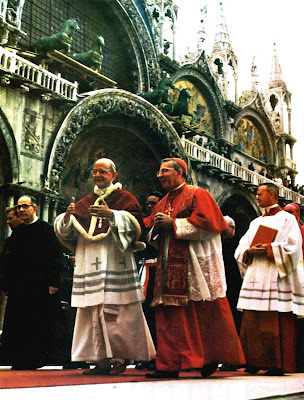 Today, Magister gives a fascinating follow-up to this topic, a series of stories from the diaries of Virgilio Cardinal Noè, who served as Papal Master of Ceremonies during the earliest and wildest years of the reform, from 1970-82. These stories are cited from a new book published in Italian by Mons. Leonardo Sapienza, “Paolo VI: Una Storia Minima.” (On the website linked by Magister, it is described as a book of “fioretti - little flowers”, the name of a very famous collection of anecdotes about the life of St Francis of Assisi and some of the early Franciscan Saints.) No one will be surprised to read that Paul VI himself expressed grave reservations and disappointment about some of these changes, although he himself had approved them, and, heroically exercising the virtues of Prudence and Fortitude, did nothing to correct them. Here are just a couple of examples; there are more in the original article linked above.